Morrisons Foodservice’s has a brand new range of Corrugated Fish & Chip Boxes. The new design employs blue and yellow colours which gives a vibrant and attractive appearance. They will be available in 3 sizes: Small, Medium and Large. 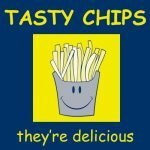 The small size (chip box) is 6 inches square which is ideal for a portion of chips. The medium box is perfect for a standard sized supper. And the large box is suitable for packing a large angel cut fish into. Increasing numbers of fish friers are converting to packing their fish & chips into corrugated cardboard boxes. There are several benefits of using these boxes such as: they make fish & chips more attractive and presentable; helps staff with portion control; makes it easy for customers to eat on-the-go; keeps food warm without sweating. And that’s not all, there will soon be a paper carrier bag and printed greaseproof paper to match! 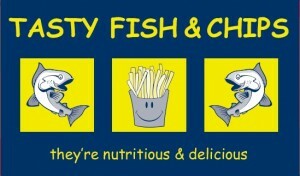 Therefore, you can have an entire theme of Tasty Fish & Chips to promote your food to your customers. If you are interested in these products, please view the Cardboard Meal Boxes page.